A revolutionary research initiative in Cornwall is using mobile technology to transform the treatment of a rare and poorly understood condition. Bringing together the region’s leading academic and digital experts, the project is shedding light on how the symptoms of Ménière’s Disease can be mitigated and managed. Ménière’s is an inner ear condition that profoundly affects the hearing and balance of around 160,000 people in the UK, yet there are large gaps in our understanding of how the disease is triggered and develops. 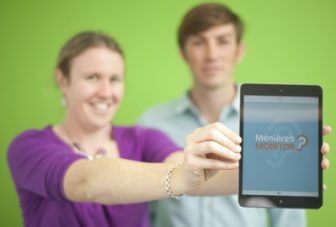 In a bid to transform how we treat this chronic illness, the University of Exeter Medical School has partnered with Cornish digital company, Buzz Interactive, to develop a mobile application that can record symptoms on a daily basis. The team are creating a database of information on the disease to help in their analysis and are feeding results straight back to sufferers – empowering them to manage their own symptoms more effectively. Linking the mobile app with weather information from the UK Met Office, the research is also hoping to uncover associations between Ménière’s and meteorological conditions, a move that could see the tool used to send out early warning messages to people. Working with the Sensory Trust, this joint research project is undertaking a systematic review to assess the health and wellbeing benefits of sensory experiences, especially in the outdoors. A ground-breaking research partnership is hoping to reinvigorate children’s connections with nature through a new method of teaching. In a pioneering research initiative, John Tredinnick Rowe has worked with Spiezia Organics to improve understanding of how the health and wellbeing sector can work with mainstream organisations such as the NHS.